A state of emergency has been declared in three of Ecuador's oil-producing regions after workers began a strike over pay and working conditions. The eastern provinces of Napo, Orellana and Sucumbios have been placed under military control to prevent further unrest, a government official said. 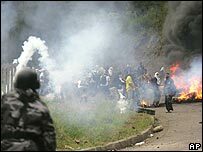 It is the second time in recent weeks that the government in the capital, Quito, has had to take such measures. Ecuador's oil production accounts for nearly half of its annual budget. The government-run company Petroecuador said the strike had already damaged production in the oil-rich provinces. The company said workers had taken control of one of their installations demanding wages they say have not been paid, and better working conditions. The Ecuadoran government has withheld payments to Petroecuador demanding that it improves the transparency of its accounting. Officials have been negotiating with the workers to end the strike, while the military moves into positions in the jungle provinces to prevent further unrest. The state of emergency means that basic rights to freedom of movement and privacy have been suspended and the security forces will be able to search homes at will. The government imposed a one-day state of emergency in Napo province 15 days ago after protests demanding that the oil companies invest more of their profits in the region.